A £1.7million Mearns mansion is still up for grabs after its festive-themed raffle deadline was extended for a second time due to “insufficient entries”. The six-bedroomed Johnstone lodge near Laurencekirk is being raffled off to raise one million pounds for a Dundee charity. Five pounds from each £25 entry will be given to The Yard to help them provide services for youngsters with disabilities. But one man who bought a ticket for the ‘Win a Mansion for Christmas’ competition has now asked for his money back. He now wants all the money returned to ticket holders because the December 20 deadline has been further extended to March 31. Home owner Donna Pirie, 54, said she had pushed back the draw date in order to raise “even more” money for the Dundee-based charity and added: “I never actually said which Christmas you could win it by. “I can draw it at any time but this is to raise money for charity. 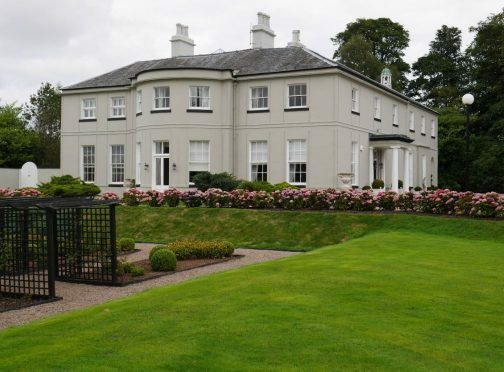 The property, which sits on a 32-acre estate featuring a private nine-hole golf course, will be won after a draw is made, with the running costs of the mansion included in the prize.